In this episode Jerry Baltus provides his expert opinion on exit planning when it comes to selling your business. 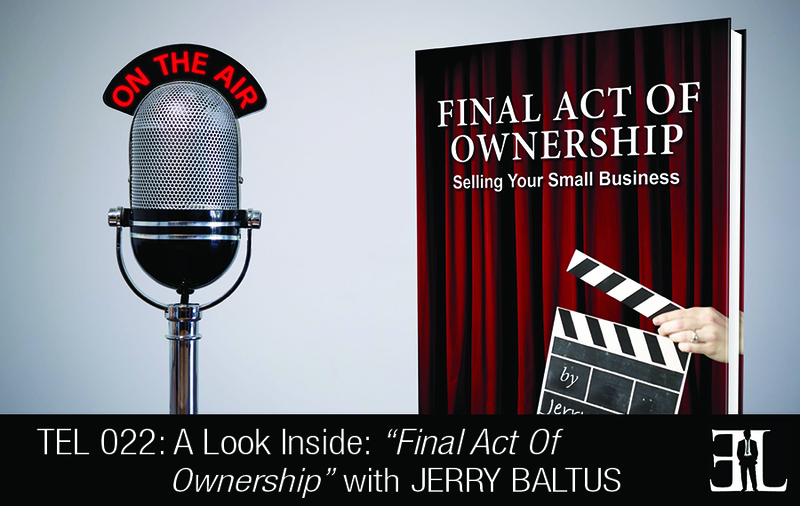 The difference with Final Act of Ownership is that Baltus focuses on small businesses and talks directly to business owners only. This book is less technical and is written to make it easier for a lay person to follow. Most business owners who read the book may not realize all the ends and outs of what it takes to sell the business and people only get one shot at this for the most part. What I find is that other resources on this topic tend to be targeted at larger businesses and not so much at the smaller ones. My book is less technical and is written to make it easier for a lay person to follow. Most business owners who read the book may not realize all the ends and outs of what it takes to sell the business and people only get one shot at this for the most part. It’s meant to educate the owners not the professionals that might be involved. The reader can skip through it and read different sections. I think it reads fine from beginning to end as well but there are tidbits of information throughout that if you were interested in a specific topic you would be able to read just that chapter and get a sense of it. I am also proud of the information in the book of the emotions of buying and selling which is a topic that is not often talked about. The one lesson that I repeat through the book is this idea of not waiting until the last minute. Even when you start a new business, it’s important to be aware of the things that create value and begin working on those things immediately. The book starts out talking about the emotions involved in buying and selling your business. We talked about the fears that a business owner might have in never having sold a business before and how to go about it. I think there are a lot of business owners who have the idea that their business has no value and there is sometimes a lack of trust among small business owners about some of the professionals that could really help. We deal with those emotions; we deal with the idea of the culture that the owner wants to maintain with the business so that a new buyer would be able to carry on the legacy that the owner has created. The second chapter talks about the various types of buyers that you might look for and why certain types of buyers would be attracted to certain businesses. And how the buyer might impact the actual evaluation of the business or the price they would be willing to pay. Chapter three talks about valuation and we talk about the numbers and what your business is worth on paper. I would like to stress that valuation is only skin deep, it’s important to know but it doesn’t necessarily determine the price. The price is always determined by what the buyer is willing to pay and what the seller is willing to sell the business for. Valuation is really helpful in terms of educating both the buyer and the seller in terms of where you are at. Chapter four takes a different view of valuation and it’s based on a gentleman that I’ve come to know named John Warrillow who wrote a book called Built to Sell. John did a great job talking about the non-numerical factors that make up valuation and he created a tool called the sellability score which I find tremendously useful in educating businesses. We talk about the level of satisfaction that the customer has and the type of uniqueness that the business has in its market and the growth potential. In Chapter five we talk about preparation for sale and having a strategic plan as you prepare your business for sale. The buyer might be interested in knowing what the seller’s viewpoint of the businesses future is so that they have a feeling that there is a future. One of the most important things is we try to educate people how you go about creating a list of target buyers for your business. Chapter seven is short but it deals with putting a team together and not trying to do this all on your own. I am located in Plymouth, Wisconsin. I have been a business coach for nearly eight years and have built my business around helping business owners be more successful in their business in a variety of ways. I am an avid reader and bicyclist too. I really didn’t start out to write a book, I just wanted to write a white paper to support some of the work that I do in regards to exit planning with business owners. It grew as I realized that familiarity with all the aspects of selling a business just was not there. As I started to write I realized I had a lot to say on the subject and it grew in to a book.